Woohoo it's Friday and that means the weekend has almost landed, what weddingy things are you all upto this weekend? For me its meeting some of my 2014 couples tomorrow and a wedding fair on Sunday! If your wedding is coming up in the latter part of this year then this post will most definitely interest you. 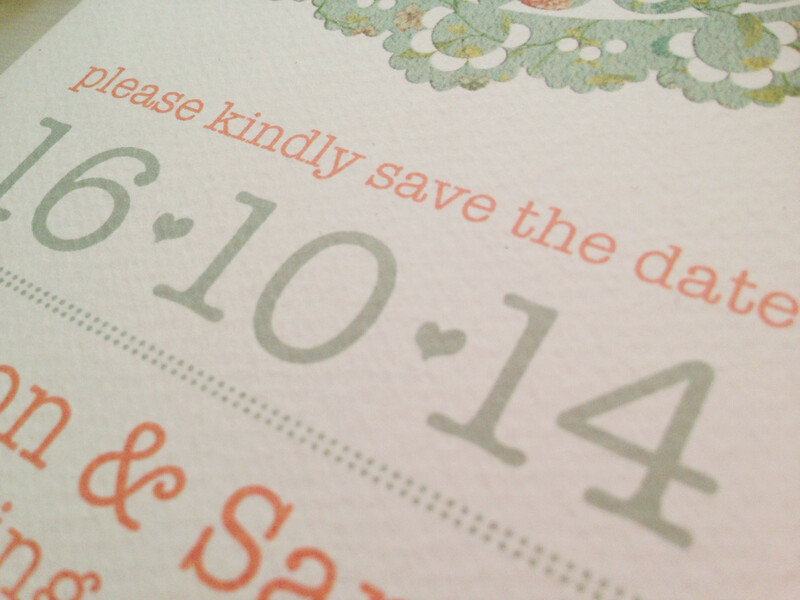 It's time to get those invites out, and it's never too early to send your save the dates for 2015! 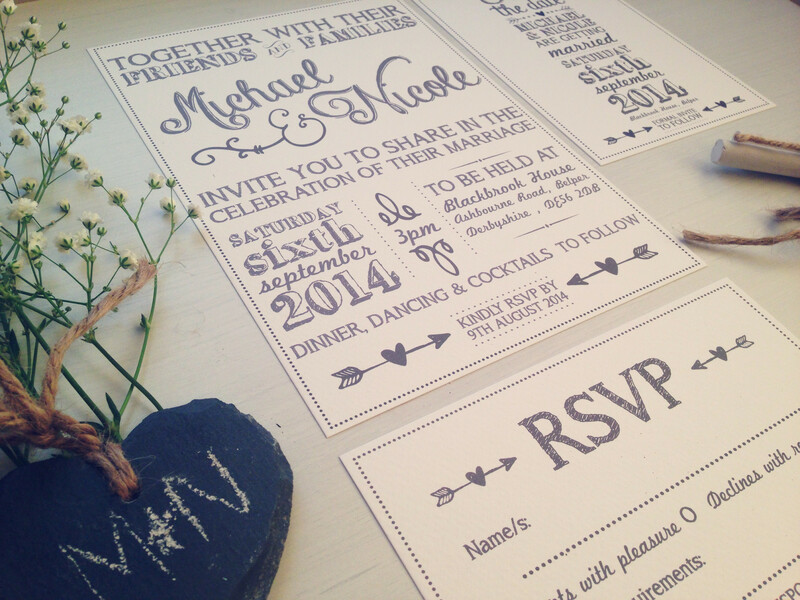 Today we're getting to know Mirlah from Best Day Ever, a very pretty new wedding stationery company based in Derby. I'm actually photographing Mirlahs wedding next year and I was so excited when I saw that she was joining this crazy industry of ours by setting up her own stationery business, her designs are absolutely gorgeous and very affordable. Tell us about what do you do and what services you offer? Here in glorious Derbyshire I live for celebrating all life’s special moments, big, small and fabulous and love nothing more than creating wonderfully pretty wedding stationery for lovely couples! Best Day Ever creates designs that suite you, your personalities and your wedding style. Whether it’s one of our ‘ready to rock’ designs or something more bespoke, we’re sure you’ll find what you’re looking for and at a purse friendly price! How long have you been doing it & how did you get into it? Officially I launched best day ever February this year with a brand spanking new website and collections but I first started working within in the wedding industry by blogging for some fantastic Wedding Suppliers about a year ago. I’ve always had a love for designing, crafting, styling and of course, weddings and after creating pretty paper goodies for friends and family I decided I'd quite like to share the love. Ta Da! Best Day Ever was born! Lots of people love the vintage, shabby chic style, and quite rightly so It’s wonderful, but I find that people also like a splash of modern design and simplicity; I think my collections are the perfect mix of old meets new. 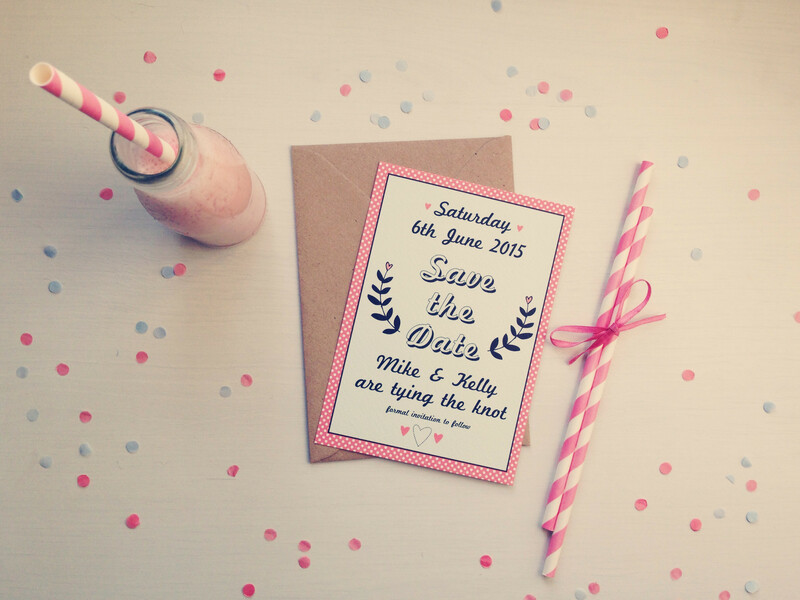 The stationery designs tend to draw on inspiration from decades gone by and play on vintage style but often have a modern twist to keep them fresh, fun and up to date. 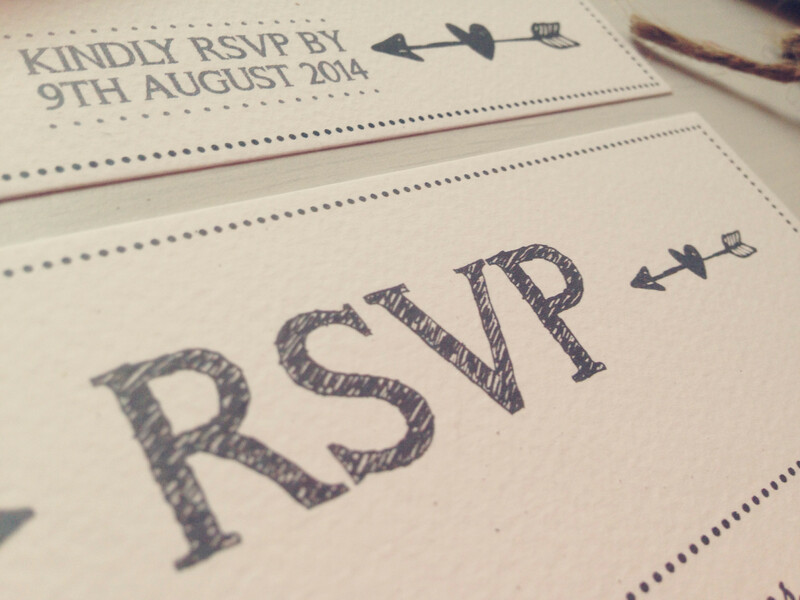 Best Day Ever is all about personal and unique service, so where needed I’m on hand to suggest alternative wording options to make sure their invitations are a true reflection of them as a couple. I believe couples should have the very best on their wedding day regardless of budget and I pride my products on both affordable design and top-notch quality. I like to think there’s something for everyone at Best Day Ever, whether it’s a design from our personalised ‘ready to rock’ collections, something completely bespoke or our ‘We’ll take it from here’ option, there’s something to suit all budgets. 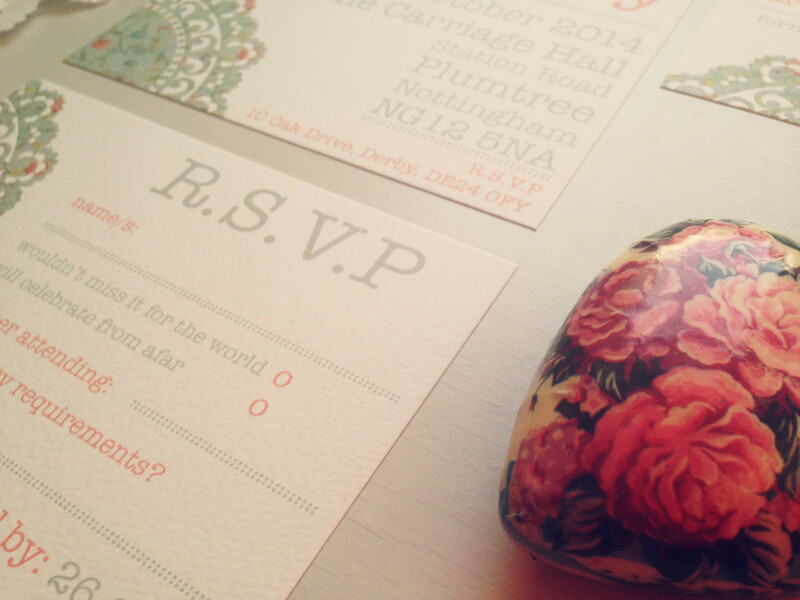 Our we’ll take it from here’ service is where couples can choose to roll up their sleeves and print their invitations from home, this option is the best of both worlds; wonderfully pretty design and a cost effective personal touch. I just love being a part of the build up to a couple’s big day. An invitation is usually the first glimpse of the wedding day that guests see and can play a real part in setting the tone so it’s an absolute pleasure to be involved in that. Do you have a money-saving tip for Brides & Grooms to be? Just remember it’s your day and don’t feel pressured to go completely crazy and blow the bank. Have a budget in mind and do your best to stick to it. Like I said before, everyone deserves the best on their wedding day regardless of budget, you just have to get a little more creative with your cost cutting. I’m totally loving being engaged and cannot wait until our big day next year. I’d say the best way we’ve saved a few pennies is by ‘shopping ‘around. There are so many fabulous suppliers out there, brides and grooms are spoilt for choice and it really pays to do your research and find out as much as you can and not just go with the first thing you see. There are 2 new collections coming very soon. If you like colourful stripes with a mix of pretty florals or something simple and rustic you’re going to love what’s coming! 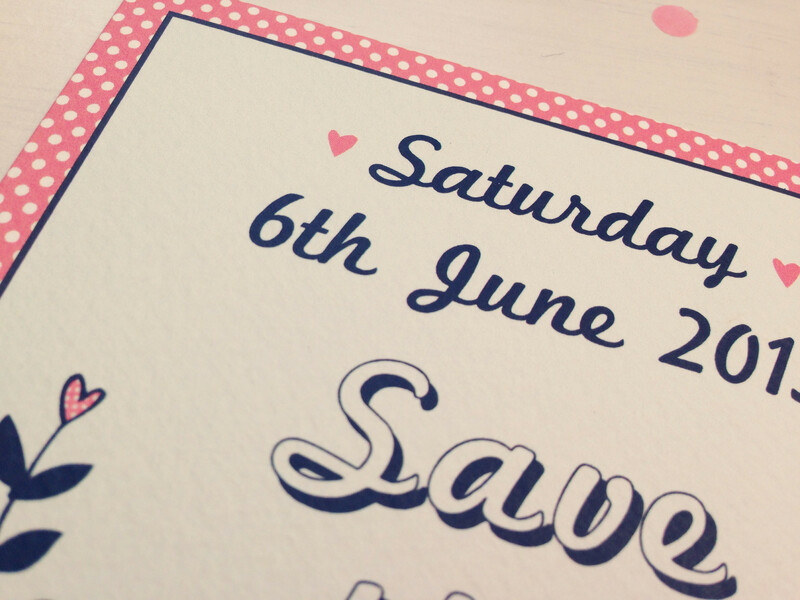 Current Collections Save the dates- £1.50 Invitations £2.00 full prices on our website. Strawberry Shake: Inspired by the iconic colours of the 50s this collection has had a shabby chic makeover to bring a softer feel to the bold turquoise and red. 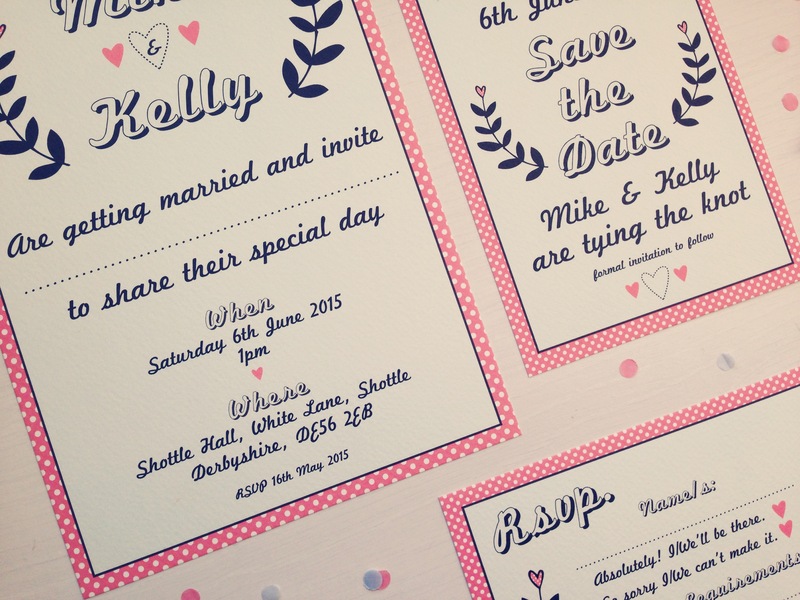 Featuring a polka dot border and a mix of bold and pretty love hearts and laurels, this collection is fun, flirty and oh-so-cute. 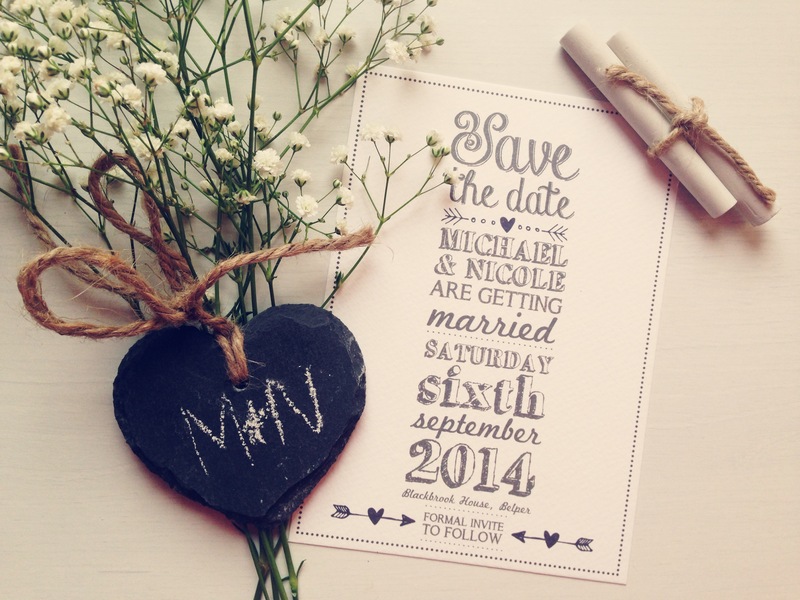 Vintage Chalk: The Vintage Chalk Collection is a beautiful softer elegant take on popular chalk board signs. The striking text mixed with the soft grey and cream colour palette makes this collection bold but oh-so-beautiful. 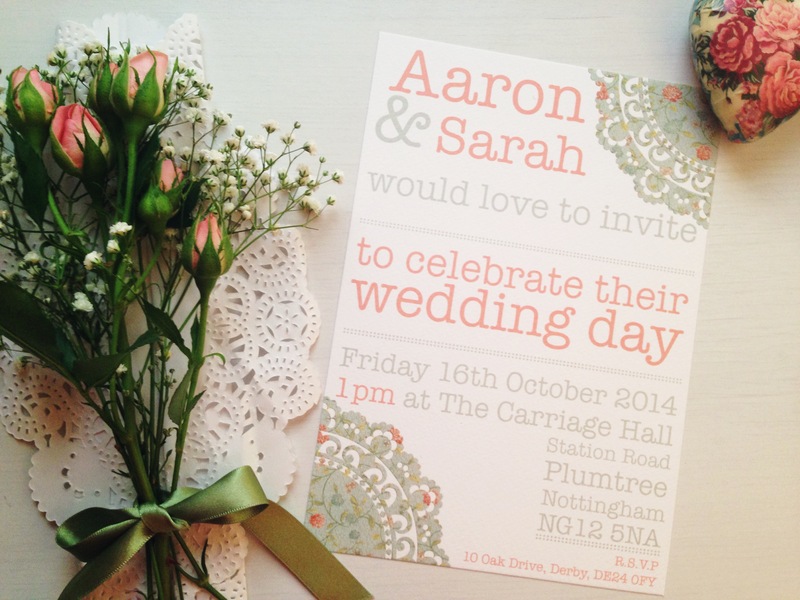 Doily Daydream: Inspired by our love for doilies this collection has a lovely rustic feel. By mixing the typewriter font with a fresh modern colour palette and a dash of shabby chic floral pattern, this collection is beautifully pretty with just the right amount fun.